Ready for a "wow-I-really-can&apos;t-believe-this-view" hiking adventure? Head to Big Bend National Park in West Texas. From an elevation of 1,800 feet along the banks of the Rio Grande to almost 8,000 feet at the tippy-top of the park’s Emory Peak, the trails of Big Bend offer experiences, variety, and vistas that will both challenge and charm you. The view extends all the way to Mexico, with a cobalt blue sky, crossing several majestic mountaintops along the way. Just as we were wrapping our heads around that stunning scene, a group of hikers coming down the trail assured us that the top of the trail was even more breathtaking. That was pretty much true of every hike we took at Big Bend National Park, located in the U-shaped dip in the western border between Texas and Mexico. After encountering one spectacular panorama, we’d turn the corner and bam!—we’d be knocked out by yet another. It’s not just the mountain views, either. Traversing the desert canyon, discovering a waterfall along a forested path, or seeing a group of javelinas scurry through the cactus bushes are all part of the extraordinary Big Bend experience. There are developed campgrounds as well as backcountry sites, but we reserved a room several months in advance at the Chisos Mountain Lodge. Not only was it a convenient starting point for several of the trails, but the restaurant offers hearty food and idyllic views, making it the ideal spot to relax, recharge, and watch the sun set after a day of hiking. The staff there also provides a takeout lunch on request, so we picked that up on the morning of our first hike. Billed as one of the easier hikes in the park, this five-mile round-trip started with a gradual climb that took us past Casa Grande, a dramatic mesa outlined against the sky. The trail soon turned into a series of switchbacks, and we were glad we’d brought our hiking poles. Once we arrived on the ridge, it was just a short walk to the summit. What we saw from there had me wishing I’d paid more attention in geography class. Valleys swept up gracefully into craggy peaks, then out to miles and miles of colorful desert. There was a dramatic vertical rock formation nearby that made a great backdrop for photos. For this hike, we took the suggestion of a couple we’d met at breakfast and drove from the lodge down to the Chisos Basin campground to begin there. Since this trail runs downhill to its destination, the lower-elevation starting point would make our hike back up the trail shorter and less demanding. Thankful for the advice, we headed out. Once on the trail, we could see our destination—a tooth-shaped mountain called Carter Peak, next to the Window. We were quickly enveloped by the wilderness, winding through canyons and along quiet, tree-shaded paths. It took us a little over an hour to reach the Window, a vertical opening of about 10 feet between two walls of stone. We stepped up and were greeted by mountains and desert stretching out before us as far as we could see. It was easy to imagine tribes of Chisos Indians, the first inhabitants and the mountain range’s namesakes, hunting bear and making their homes across this rugged range. The trip back was uphill, so we paced ourselves and made it back within two hours. The next day we took a break from the trails and visited the Hot Springs Historic District. From the parking lot, we took the short walk to the springs, where water enriched with mineral salts bubbles up at approximately 100 degrees. A therapeutic soak brought relief to both body and soul, and after a good night’s sleep, we were ready for the challenging South Rim trail. Thanks to recommendations from previous hikers, we took the Pinnacle Trail up to the South Rim, where we welcomed easy-to-navigate switchbacks along with generous shade. Once on the South Rim trail, we found areas of green meadows, creeks, and waterfalls that buoyed our spirits and quickened our steps. Reaching the South Rim itself, we saw a vast expanse of land that peaked and fell, looking more like a roiling ocean in freeze frame than a dry mountain range. At this point, photo opportunities abound, and we spent at least an hour on the rim marveling at the power and scope of nature. While Big Bend National Park is wildly fascinating, there are other places in Texas that hikers and nature lovers frequent as well. 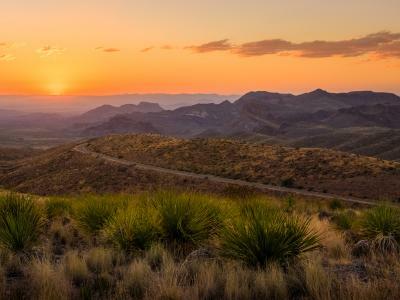 The Davis Mountains—also in West Texas—consist of mountain trails and incredible views, and they are greener, generally cooler, and less remote than Big Bend. Plan early enough to reserve a room at the Indian Lodge, a historic motel in the park that was first built by the Civilian Conservation Corps. The 4.5-mile Skyline Drive Trail is our favorite, as it ranges up, down, and around forested mountains and scenic valleys. 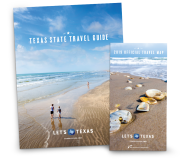 South of San Antonio is a spectacle not found in many regions of the Lone Star State. Lost Maples State Natural Area offers more than 2,000 acres of rolling hills thick with trees—bigtooth maples, bald cypress, sycamores, and oaks—that burst with riotous color every fall. There are fairly easy hiking trails throughout the park that provide insanely beautiful views. We like to stay at The Lodges at Lost Maples, a charmingly rustic place with over-the-top hospitality. 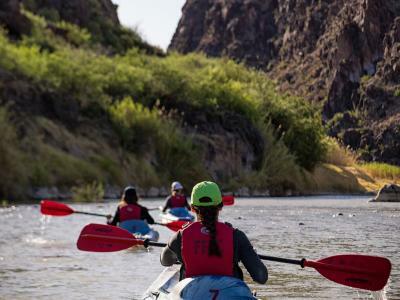 Big Bend National Park is home to a dizzying array of ecosystems—river, creek, mountain, and desert—that earned it an International Biosphere Reserve designation in 1976. The park is rich in critters, too, with bats, birds, eagles, deer, coyotes, black bears, and a couple dozen mountain lions that, thankfully, rarely make an appearance.